This newest Texas Instruments talking calculator is identical to the standard TI - 36X, which makes it easier for blind students and teachers to learn. Its speech is clear and natural and can be adjusted for quiet or verbose operation. Each key is spoken when pressed as is the display. It has a unique learning mode that allows for key identification without interrupting the operation. 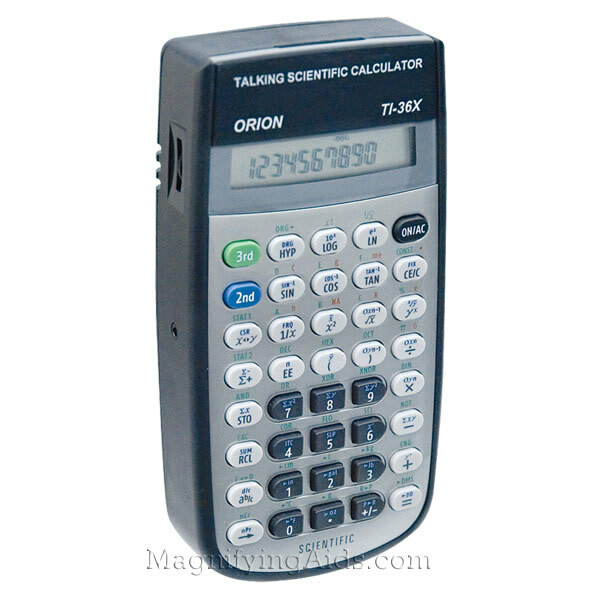 Performs over 127 scientific functions including 1 and 2 variable statistics, trigonometry and unit conversion. It measures 6.2 inches x 3.9 inches x 1.3 inches and operates on a high capacity rechargeable battery or AC power. Includes a protective snap cover, earphone, and AC adapter.